(un)Gather is a project consisting of 200 "travelers" - small handmade clay forms created to be dispersed through the natural movements of the people carrying them, and then mapped as they move around. The pieces themselves range in size from 1.5"- 3" (4-8cm). 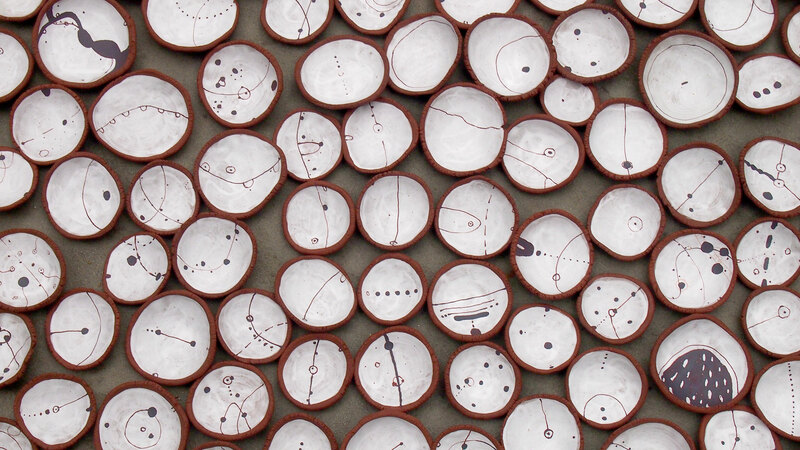 They are made of a brown clay body with white underglaze. Each piece has a different design drawn in a red iron oxide stain. All 200 clay forms will be taken on an airplane June 13, 2016 from San Francisco, California to Istanbul and then onto Greece and Stockholm. As I meet people on these flights and visiting various cities I will hand them out. I will ask each participant to take it on their journey and then input the address they place their traveler along with uploading a photograph. We will be able to see how the travelers disperse and how the people who received one chose to place and document the ceramic piece. I'm excited for people to have the opportunity to make decisions about the travelers such as location, placement, and how to best photograph the work. Will the location be in a restaurant? Will it be resting on a cliff or a window sill? Will people be in the photograph or just objects or a landscape? I want the participant to experience the decision making process of an artist. The process can be fun and empowering and it can also be intimidating and self-doubting. I hope it will connect more people to the idea that art can enhance one's life. For this undertaking, I wanted to make something that could build on my travels—something that would have a travel life of its own and go places I may never have a chance to visit. While all art has the implicit intent to communicate with other people, I wanted to make something that people could interact with more directly. I wanted something that people could touch, participate in, could walk away with, and could actually possess. I like to meet new people, hear their stories, and share experiences with them. This project is a way for me to infuse my work with the same ability to connect people and connect with people. I imagine if a person can get over his or her initial skepticism I think some people will be excited and interested in this project as I am. There is an opportunity to experience something different and be part of a creative process. As an Associate Professor of Art at a college in Northern California I teach many students art appreciation. The class discussions around a few artists excite my students and open the door to seeing art as more than just going to a "stuffy building" and looking at "pretty pictures". Keith Haring's graffiti work that was made on the walls of subway stations in the 1980s brought the art to people. It was no longer something that had to be visited in a gallery. It told a sequential story as a passenger rode the subway from home to work. The same is true of Jeanne Claude and Christo with installation work starting in the 1960s. Their work was installed in a specific location and up for a period of time. The people who lived in that location were asked to be a part of the process of installing it not in a building but in nature. Students are initially baffled by the conceptual work of Felix Gonzalez-Torres from the 1990s then they are delighted that they can not only touch some of his work in a museum but also put it in their backpack and take it home. I wanted to make something that other people had an opportunity to connect to and participate in. Similar to Felix Gonzalez-Torres the ownership of the work changes without any money being exchanged. However, with my work no one has entered a building to look at art. In addition, I'm interested in the choices that are made by the individuals who take a piece. I'm asking that person to not only take on a responsibility and reconnect with me but be a part of the decision making process.